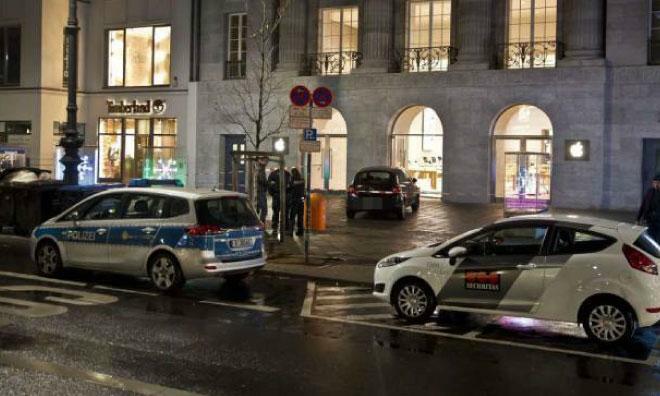 Thieves crashed a compact car through the front door of Apple's Kurfürstendamm store in Berlin and made off with several display devices during an early Monday morning smash-and-grab. German police suspect the robbery was committed by a gang that is believed to have hit several other high-end retailers in the nation's capital city, according to Bloomberg. Most recently, the same crew is thought to have staged a similar break-in at a shopping mall near Berlin's famous Alexanderplatz square that saw the thieves make off with about 100,000 worth of electronics earlier in December. The bandits used a stolen Opel Corsa, a small hatchback similar to a Honda Civic, as a motorized battering ram to break through the store's glass front doors at 4:15 a.m. local time. Because the store's inventory had been locked away for the night, only around 20 demonstration iPhones, iPads, and laptops were taken, according to Thomas Neuendorf of the Berlin police department. After grabbing the merchandise, the group reportedly sped off in two Audis. Authorities declined to place a value on the haul. Photos and video of the scene show one of the several-inch-thick steel-framed glass doors having been thrown completely off of its hinges, while several iPhones were missing from a display near the entrance. Workers have already begun to repair the damage, and the store is open for business as usual. At least two other Apple stores have been marred by vehicular run-ins in just over a year. The company's Lincoln Park, Chicago store was the scene of an accident earlier this year, while thieves using a similar M.O. to the Berlin robbery smashed the front windows of the Temecula, Calif. Apple store last September. The Kurfürstendamm store is Apple's only retail outlet in Berlin and opened in May of this year. 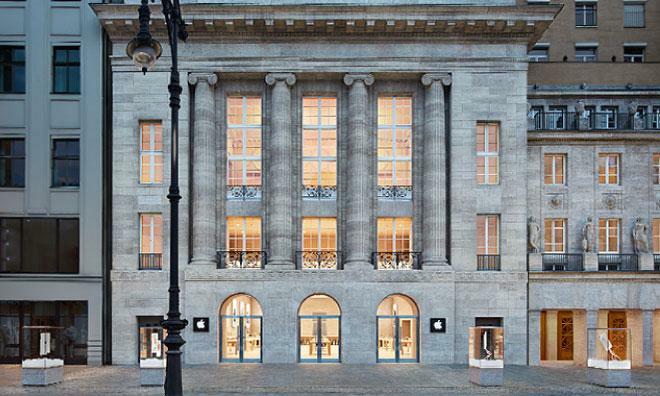 The store, located in a renovated 100-year-old theater in one of Berlin's most prestigious shopping districts, was Apple's 12th shop in Germany and took at least two years to construct.